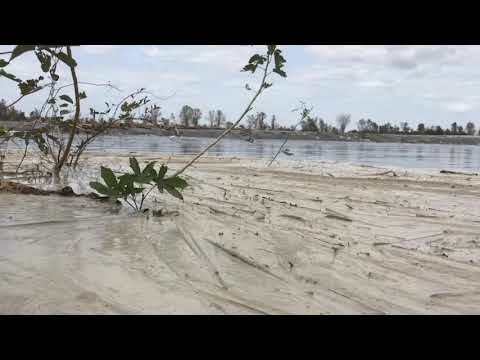 WILMINGTON, N.C. (AP) — Florence’s floodwaters breached a dam holding back a large reservoir at a Wilmington power plant Friday, and coal ash from an adjacent dump could be flowing into the nearby Cape Fear River. Duke Energy spokeswoman Paige Sheehan said the utility doesn’t believe the breach at the L.V. Sutton Power Station poses a significant threat of increased flooding to nearby communities. Floodwaters breached several points overnight in the earthen dam at Sutton Lake, the plant’s 1,100-acre (445-hectare) reservoir. Lake water then flooded one of three large coal ash dumps lining the lakeshore. Sheehan said the company can’t rule out that ash might be escaping the flooded dump into the river. No environmental regulators were at the scene as of sundown Friday, with officials citing unsafe conditions. North Carolina’s top environmental regulator said the possible environmental harm isn’t yet known. No state inspectors had arrived by late Friday, though officials said they would be there as soon as conditions are considered safe for personnel to navigate the river and be onsite. Environmental Protection Agency regional administrator Trey Glenn said his staff was monitoring the situation at Sutton from the state Emergency Operations Center in Raleigh, about 150 miles (240 kilometers) northwest of the Sutton plant. He said dozens of EPA staff were scattered throughout the region impacted by Florence, checking on toxic waste sites and oil storage facilities. Meanwhile, South Carolina’s state-owned utility said it expected floodwaters to enter a coal ash pond at one of its closed power plants. Santee Cooper spokeswoman Mollie Gore said the overtopping of an ash basin at the Granger plant near Conway should not be environmentally significant. Associated Press reporter Jeffrey Collins contributed from Columbia, S.C.